1999 Mckinney Avenue lofts you will find spectacular two story Lofts with floor to ceiling glass windows in living and dining. 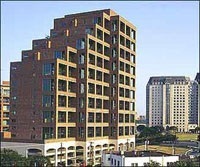 1999 Mckinney Avenue was built in 2000, and is a 11 story modern high-rise building in the heart of uptown. Each unit has stunning 20’ft windows, concrete flooring, hardwoods, exposed brick, large outdoor terraces. Amenities include 24hr conceirge, controlled access parking, outdoor pool with entertaining area. These condos are a perfect location to walk to several restaurants, Klyde Warren Park, and AAcenter.